Gas-driven glycol pumps use fuel gas at high pressure as the motive force to drive the glycol circulation at dehydration units. Kimray pumps use the high pressure gas from the dehydration unit to drive the pistons. In Kimray pumps, the gas is entrained in the rich glycol which is then released at the regeneration still vent and/or the flash tank (if present). In many installations the entrained gas is released directly to atmosphere representing a significant contribution to greenhouse gas emissions from these units. In order to evaluate the volume of gas that is vented at standard conditions, Kimray provides a set of emission factors as a function of the operating pressure. A detailed evaluation of a "typical" dehydration plant in Western Canada by Process Ecology indicated that the reported factors imply assumptions of ideal gas behaviour. 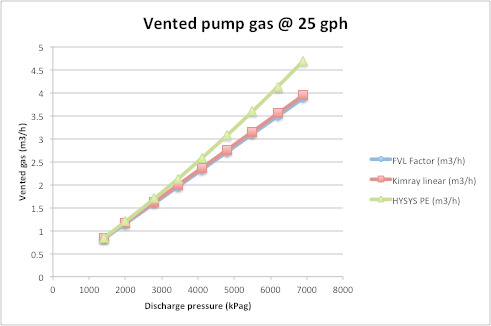 When compared to more rigorous calculations using process simulation, some significant deviations for units operating at higher pressures are revealed. The Kimray documentation notes the following: “If the wet glycol, returning to the pump from the absorber were to completely fill the cylinder, no additional gas would be needed. However, the wet glycol will only occupy approximately 65 percent of the total volume of the cylinder and connecting tubing leaving 35 percent to be filled by gas from the absorber. This gas volume amounts to 1.7 S.C.F. per gallon of dry glycol at 300 psig absorber pressure and 8.3 S.C.F. at 1500 psig and may be considered as continuing power cost for pump operation”. Taking into consideration that the volume of the cylinder is fixed, the process simulation model employed specifies a fixed “actual” gas volume of 0.081 acf/gal; by specifying an actual volume, the model performs the required thermodynamic calculations to estimate the vented volume at standard conditions for any discharge pressure. It can be concluded that the Kimray factors in use to estimate vented volumes are accurate for the lower pressures while introducing more significant errors at higher pressures. The volumes reported by the simulation model will tend be higher, particularly at higher pressures where deviations from ideality are more pronounced.